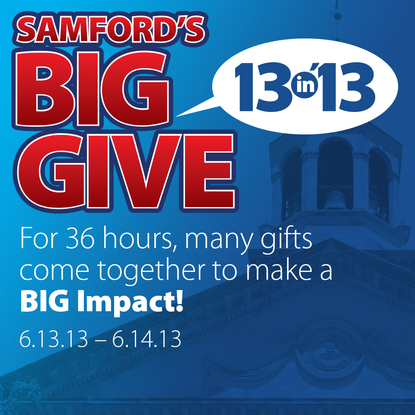 Samford University alumni, parents and friends can be a part of the school's first-ever "Big Give" on June 13 and 14. The 36-hour on-line giving campaign will allow individuals and businesses to show their support through gifts that will be designated to the Samford Fund and will benefit the university's area of greatest need. The Big Give will begin at 9 a.m. CDT on Thursday, June 13, and end at 9 p.m. on Friday, June 14. During that timeframe, online giving can take place via computer, smartphone or tablet. Credit and debit card donations can be made through the campaign site at www.razoo.com/story/SamfordsBigGive2013. "The minimum gift amount for the Big Give is just $10 and all donations are tax deductible," said Samford director of annual giving Kimberly Cripps. Because of the unique 36-hour window of opportunity, checks and cash will not be accepted for this giving event, she cautions. Every gift makes an impact, said Cripps. "Whether it's $10 or $50, every dollar that you donate goes to help make a difference in the lives of current and future Samford students." For instance: $140 provides a full day of class for a fulltime undergraduate; $75 supports student organizations and extracurricular activities; $30 provides internet access for project research; and $15 covers the cost of a Samford student ID for an incoming freshman. "Even $10 provides computer paper for printing class assignments," said Cripps, adding that while about 70 percent of the cost of the Samford experience for students comes from tuition, the remaining 30 percent comes from gifts from alumni, parents and friends of the university. Alumni should also consider that a large factor in determining the U.S. News and World Report rankings each year is a university's alumni giving percentage. This figure is calculated not by how much alumni give, but by how many alumni make financial contributions to their Alma Mater. With Samford's alumni giving percentage now sitting at 9 percent, there is room to improve to the national average of about 13 percent. "Let's make Samford better than average," challenges Cripps. In the days before and during the Big Give, the annual giving team will post photos, videos and status updates to Samford Facebook and Twitter pages. Cripps invites all Samford supporters to share and retweet the message. "You can read and share real time updates on the campaign as they are posted on Samford's social media sites www.facebook.com/SamfordUniversity and www.twitter.com/SamfordU," said Cripps. "The annual giving team, along with representatives from around campus, will also be using social media to thank our donors and show them how much we appreciate their support and commitment to Samford." For more information, contact Cripps at (205) 726-4180 or kcripps@samford.edu.